Any manikin may be used, or in some instances, an actor may be appropriate. 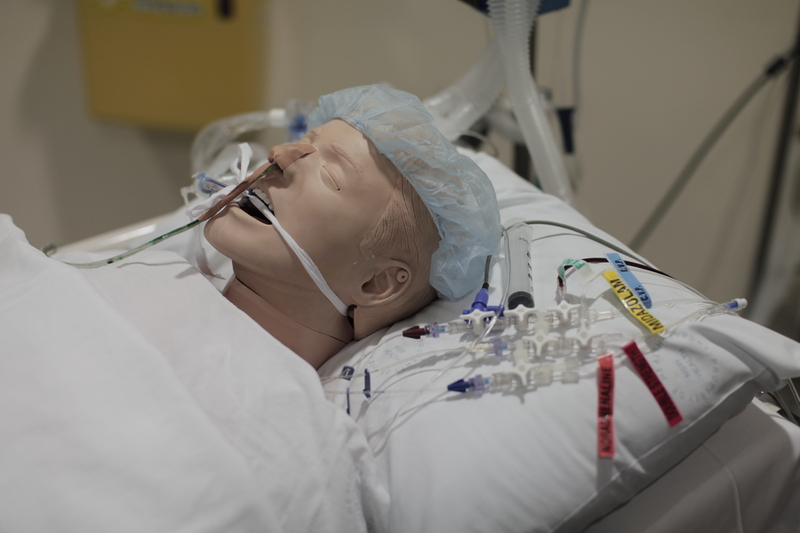 There is no particular requirement for high-fidelity features – some great scenarios can be run with the simplest manikin, but a realistic upper airway and the ability to perform chest compressions are minimum requirements. Palpable pulses are very helpful, but you can get by without them with a helper nurse or Big Brother (see below). Moulage is important, if you have time. Add dressings, bandages and make up. Get some fake blood (dilute it, it’ll go further). Give the manikin IV lines and connect them to a drainage system (see Tips), so that the participants can actually give drugs and fluids in real time, enhancing realism. Attach a urinary catheter (top tip – use cheap apple juice, lots of preservatives, doesn’t go bad for ages). How you go about this depends on your budget. 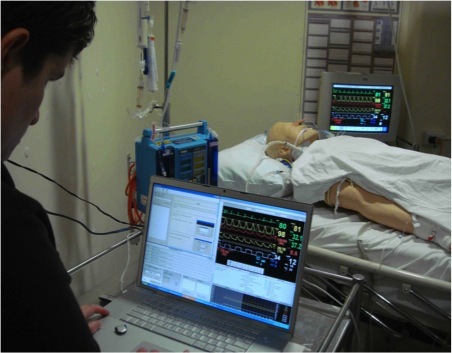 The cheapest manikins have no inner circuitry and your vital signs monitor will be a completely separate entity – though you will attach monitoring leads to give the illusion they are connected! Slightly more expensive manikins contain rhythm generators and can be attached to defibrillator/monitors to obtain an ECG display. Examples of this are the Laerdal MegaCode Kelly™ and the Laerdal ALS Simulator™. These have pulses, breath sounds and a realistic upper airway, and depending on the model, can breathe spontaneously. However, a separate screen is required (at additional cost) if observations other than the ECG are to be obtained. If you have a moderate budget, the Laerdal SimPad™ (right) with added monitor (below) can be a good solution. 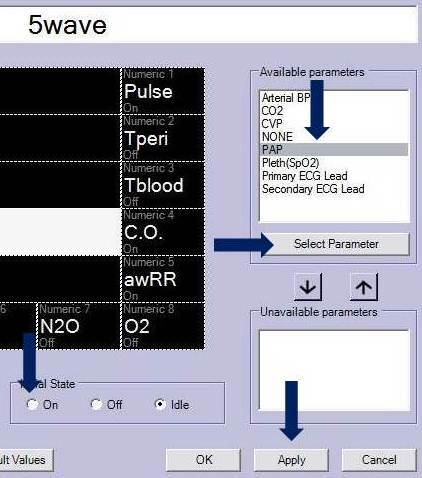 The SimPad is used to control the vital signs, which are then displayed on the accompanying monitor. Various options are available for the monitor – a laptop, tablet PC or rugged, all-weather tablet PC. The tablets offer touch screen interactivity and are therefore preferable, though they come at a slightly higher cost. The advantage of this system is that it offers a fully interconnected set up with lower end Laerdal manikins. See below for more advanced Laerdal models. Other manikins are available, but Laerdal dominate the market for a reason – they make the best manikins. Laerdal’s SimMan™ software can be downloaded for free from the Laerdal™ website. 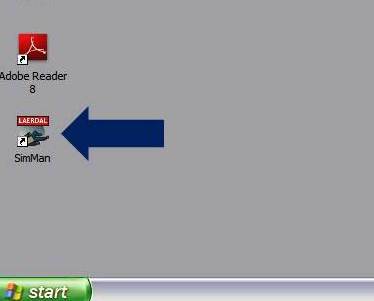 To use it, install the program on a laptop, then connect a VGA or HDMI monitor via as long a cable as you can find. 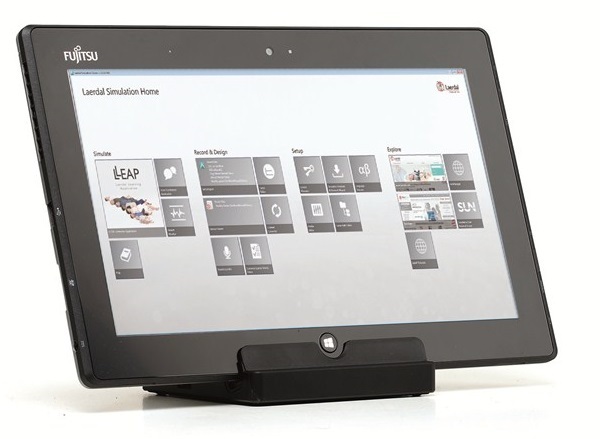 If you have a bit of money, get hold of a touchscreen monitor such as those made by elo™. This allows the monitor to be back connected to the laptop via a USB lead so that the participants can interact with the software (they can take a BP or cardiac output measurement, alter the frequency of BP measurements, silence alarms etc. This adds a lot of fidelity to scenarios. 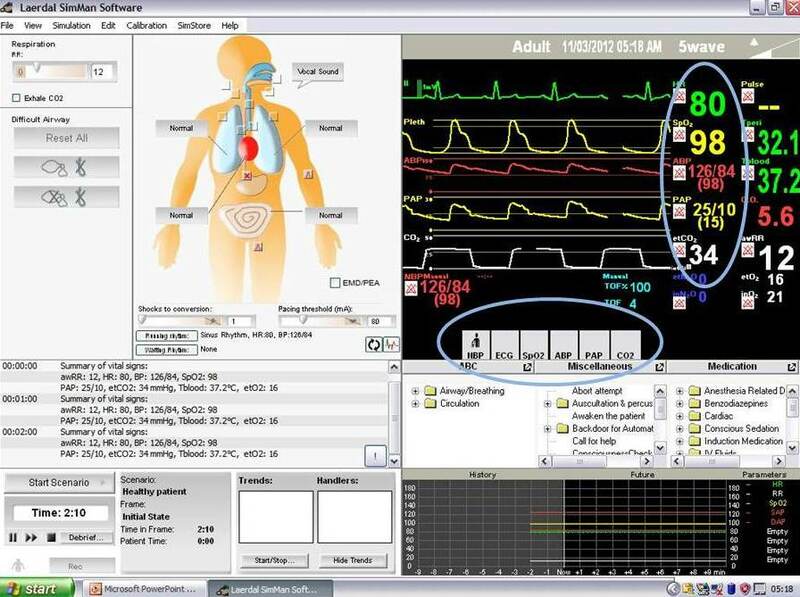 The elo software is embedded in the SimMan software which makes it work seamlessly. 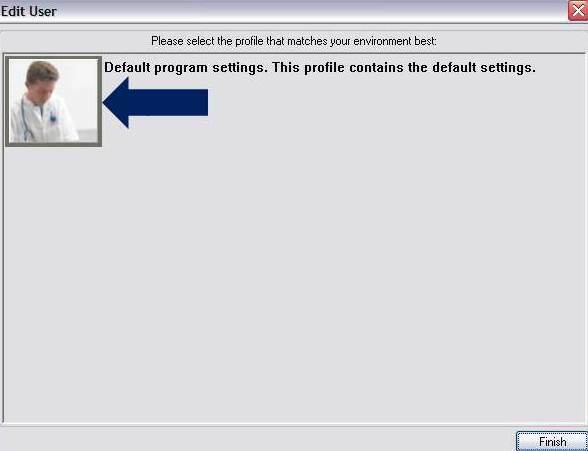 When installing the SimMan software, you will be asked to create a username and password. After this, double-click the icon to open, then click on the picture of the doctor. Running SimMan is easy. Click to activate the observations you want participants to see in the strip at the bottom of the black control panel. To alter the obs, hover over the numbers on the right and use the mouse wheel to increase and decrease. Click on the body of the waveform to change its character or to set a trend (e.g. for the pulse to drop from 100 to 40 over 5 minutes). To change the screen layout, click Edit/Edit Monitor Setup. Click on the field you want to change, click Select Parameter and set to Initial State: On. To change the colour of the waveforms to match your monitors at work, or to adjust alarm and beep volumes, click Edit/Configure. 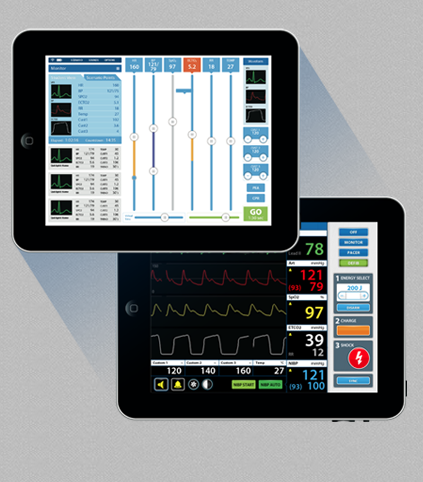 The next cheapest option for an independently controlled vital signs monitor is to buy one of the apps available for tablet devices. 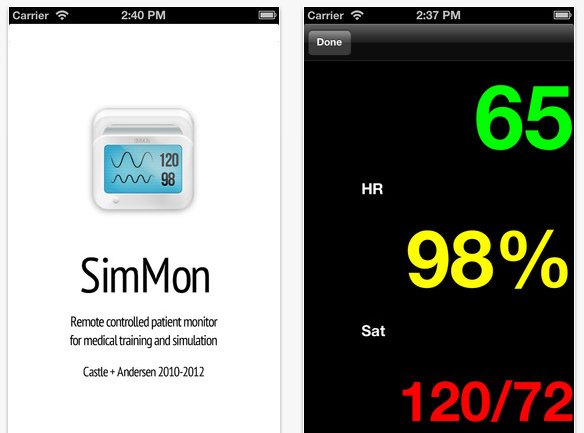 Two good examples are SimMon and simulation monitor. These are installed on 2 devices (e.g. an iPhone and an iPad, or 2 iPads, with one device being used to control the vitals on the other via bluetooth or a wireless network. The iSimulate system utilises 2 ipads and a wireless router to connect them when away from a wireless network. It is a higher fidelity option than the apps mentioned above, involves a significantly higher initial cost as well as ongoing costs for software upgrades and scenarios. 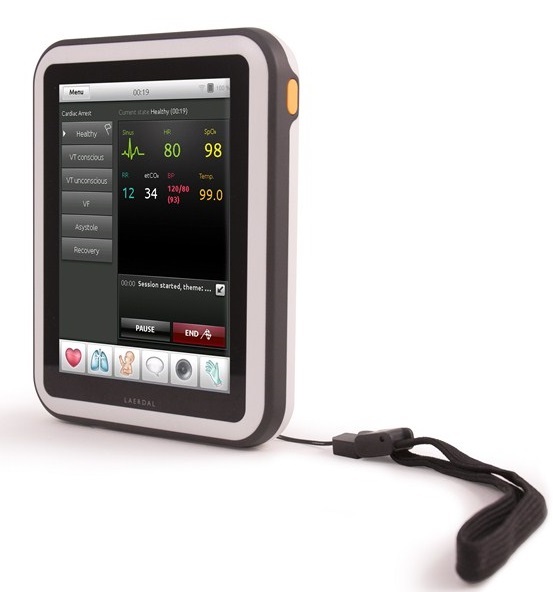 A significant advantage of the system is that the monitor can become a monitor/defibrillator with ability to ‘shock’. If you have a big budget, you might choose the full high-fidelity, fully interconnected set-up. These manikins have a full set of pulses, breathe spontaneously, blink, cry, bleed, pee, and much more besides. They are fully connected to the vital signs monitor and if attached, a defibrillator/monitor will show the same rhythm, making controlling the scenario easier. Examples of these manikins are the Laerdal’s Sim Man, SimMan Essential and SimMan 3G. 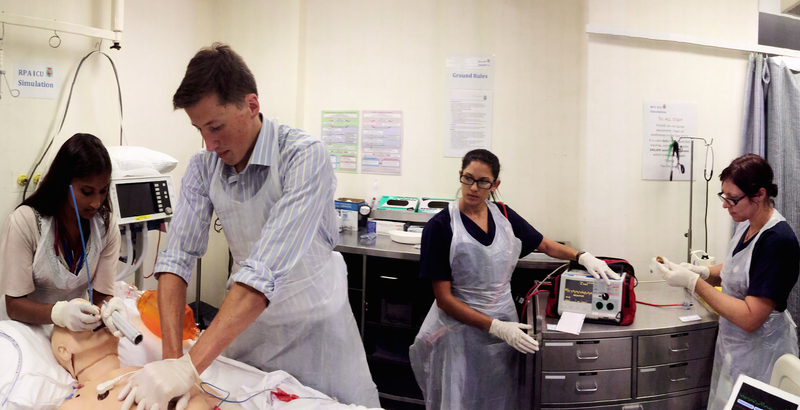 An ideal situation for mobile simulation is to use existing clinical areas and the teams that staff them. This gives the best realism, trains the appropriate team all together and tests the setup of the clinical area in an emergency situation. It is perfectly possible to use designated training areas but this can detract from the realism and validity of the simulation. Feel free to use the hospital lobby or car park as well! 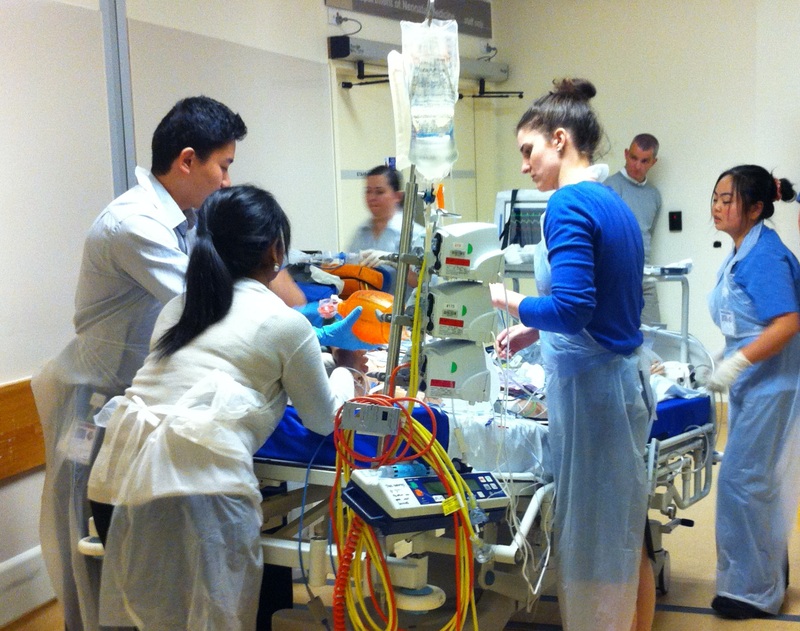 In some in-situ simulation areas, the bed-space may also be used to care for real patients. If this is the case, great care must be taken not to mix up simulation equipment with real equipment. A good method is to use an old resuscitation trolley to store the out-of-date drugs and equipment commonly used in the scenarios. This trolley should be very clearly labelled that it is not for patient use. When a patient is cared for in the bed-space, this trolley should be removed and stored securely. 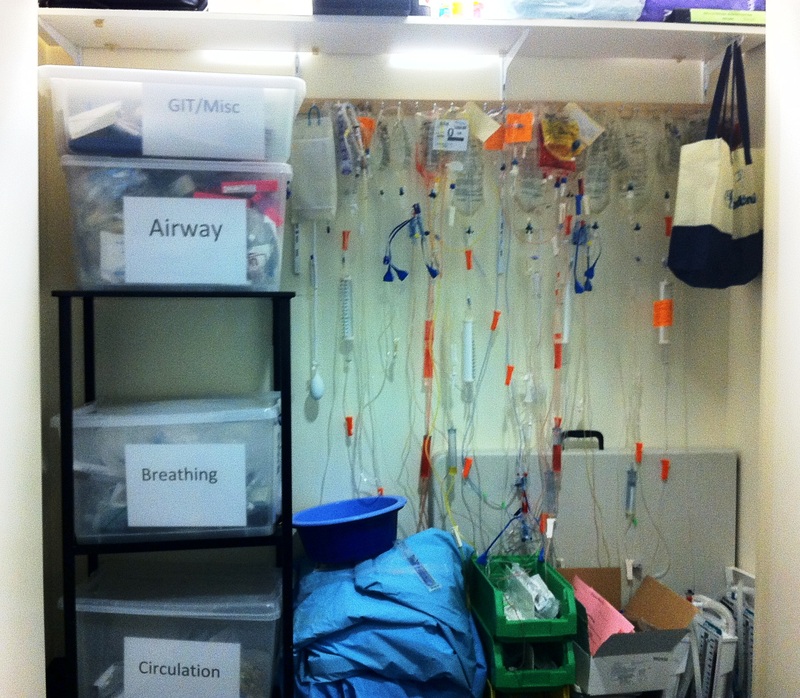 Other equipment for running scenarios should be organised in a lockable cupboard (so it doesn’t get used on real patients). Note that drugs and equipment which are not present in the resus trolley may be accessed from ward stock during a scenario by keen participants – you need to decide what level of pillage will be tolerated by the the managers! Interdisciplinary training is the way to go. Feedback I have received over the years suggests this is popular amongst all disciplines and there is good evidence that training in intact teams improves team performance (see Resources page). Ideally, participants should act in A scenario should involve between 2 and 10 participants. Any more risks overcrowding in the bed-space with the result that important actions or phrases may be missed by the observers. If you want observers to witness the action there are two options. The cheap option is that the observers stand at the foot of the bed. If you are doing this, it is a good idea to differentiate the observes from the participants. A good way is to give gloves and aprons to participants only. This way, the observers don’t get drawn into the scenario. If you have a bit of money, get cameras and microphones installed in the simulation area. 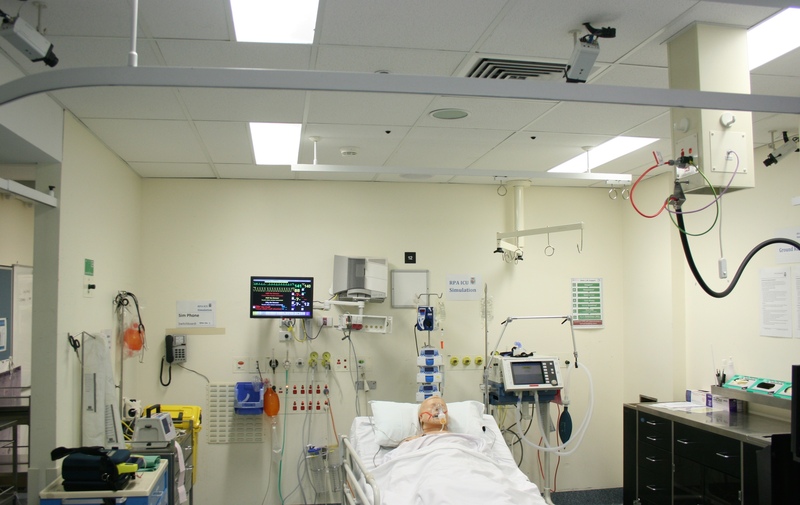 A low(ish) cost way of doing this is to use internet-protocol cameras and have them connected to the hospital network via a media encoder. This is the technology commonly used in hospital CCTV systems and is getting cheaper all the time. The footage can then be watched and/or recorded from any computer with the manufacturer’s software installed. An example of this technology is Sony’s Ipela system. Laerdal offer a more expensive system (SimView™) which has the advantage that it links to the manikin and software and can mark the timing of interventions (e.g.chest compressions and defibrillation), on the video recording. A cheaper alternative to the above is to use a handheld video camera and play back the recording after the scenario. Some newer video cameras even have built-in projectors which can make this process more rapid. You need at least two facilitators for Sim. I have run it on my own, but it’s easier with 2 or 3. One person needs to drive the vital signs monitor (and/or rhythm generator). This person needs full view of the scenario, either by direct line-of-sight, through on-way glass or by live video. They must be able to hear what is said in order to make the patient react to important interventions. After much trial and error, including making rather intimidating announcements from a loudspeaker in the ceiling (much like the voice of God), I have concluded that the best method is to use a ‘helper’ nurse or doctor: who is briefed on the scenario and gives information out piecemeal or when asked a direct question. For example, in an anaphylaxis scenario, they might announce the presence of a rash on the chest. 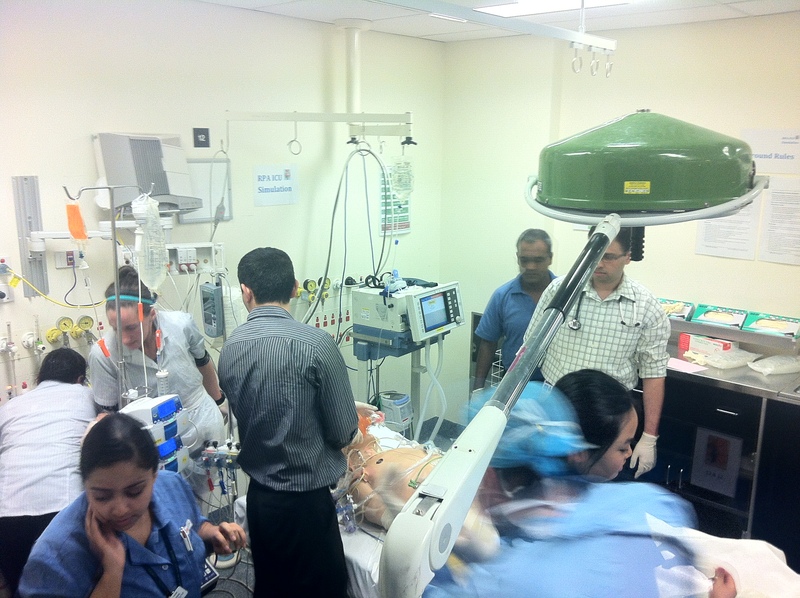 Alternatively, if the participants have gone down the wrong path with a scenario – for instance, they are inserting a chest drain because they couldn’t hear breath sounds, when, in fact, they were supposed to, the helper can listen to the chest and announce that there is good bilateral air entry. As long as during the pre-brief, the participants are told “the helper never lies” this strategy works well. It is beneficial if the ‘helper’ checks in with the scenario driver every now and then, to decide whether more or less information should be shared with the participants. This can also be achieved with the use of a walkie-talkie with a headphone which the helper wears during the scenario.